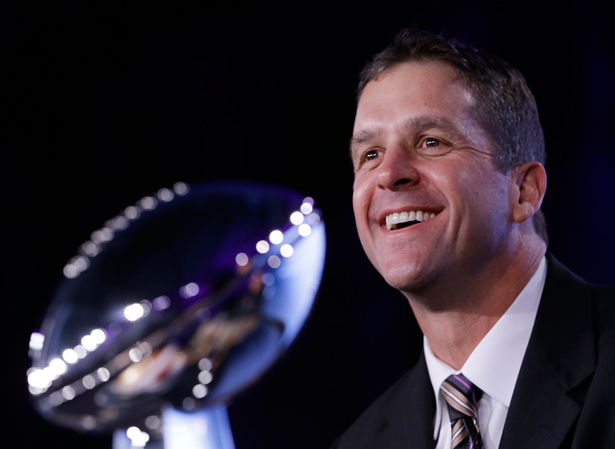 A terrific quote by Coach John Harbaugh at the Ravens victory rally deserves its historic context. It was deeply moving to hear Coach Harbaugh invoke the champ. Ali visited the team before the start of the season and was a source of inspiration throughout the year. There were stories over the weekend that the great Ali was close to death. Thankfully, this turned out to be false and his daughter Laila tweeted a picture of him getting ready for the big game and very much alive. I predict that Terrell will catch hell at the sound of the bell. He is going around saying he’s a championship fighter but when he meets me he’ll fall 20 pounds lighter. He thinks he’s a champ but after I’m finished hell just be a tramp. Now I’m not saying this just to be funny. But I’m fighting Ernie because he needs the money. It’s beautiful that Coach Harbaugh chose this particular moment of triumph to honor the Greatest. It’s also ironic, given what took place before the rally. To get to the stadium, the Ravens all traveled in massive military Humvees, as adoring crowds cheered. If we are to remember the Ali who said, “What’s my name?” it would be myopic to not also remember the Ali who said, “The object of war is to kill, kill, kill, and continue to murder innocent people.” Many in the sports media saw the use of military Humvees as a fantastic tribute to the troops. One can only wonder what these same sportswriters would have said about Ali in the 1960s. One can only wonder what they would write if a modern-day Ali emerged to say, “The object of drones, the object of assassination lists, the object of war is to kill, kill, kill, and continue to murder innocent people.” We need to remember what it was that made Ali so hated as well as so dangerous. It wasn’t his quotes. It was, as Coach Harbaugh said, his courage. Dave Zirin, the author of the Muhammad Ali Handbook, just released Game Over: How Politics Has Turned the Sports World Upside Down. Watch his interview with W. Kamau Bell.